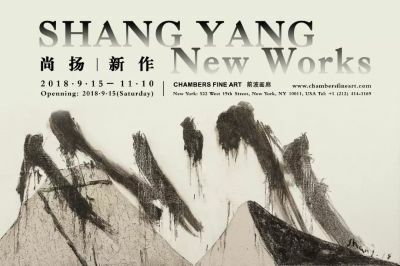 Chambers Fine Art is pleased to announce the opening on September 15, 2018 of Shang Yang: New Works (September15- November 10, 2018). The exhibition will be held in two locations, in Chelsea and at ArtFarm, Salt Point, NY. Although born in 1942 in Hubei province, China, Shang Yang was nearly forty years old when he first won wide acclaim with the painting Boatmen of the Yellow River in which he abandoned the Socialist Realist style that prevailed in China at the time and embarked on a career of restless experimentation that continues until the present day. In the late 1980s and early 1990s, ‘85 New Wave appeared, the wide-spread proliferation of artist associations that occurred in China in response to the influx of information regarding contemporary art, literatureand philosophy in the West during the 1980s. Although Shang Yang was less affected than artists of a younger generation by the stylistic experimentation, he entered a brief period of stylistic polymorphism. The most important ofthese phases occurred in 1988-1989 when he executed a group of abstract paintings titled States in which the focus was on the nature of the materials. At ArtFarm the Cataracts and Cataract Sections will surprise even those most familiar with the arc of Shang Yang’s career. What exactly are these mysterious abstract works, the Cataracts mostly presented like unidentifiable relics in Plexiglas boxes and the unframed Cataract Sections that hang in front of the wall rather than being attached to it like a painting? The Cataracts derived ultimately from the first Painting Albums of 2008 in which the partial removal of a layer of synthetic material from the surface of the works was a revelatory moment for Shang. “There was pleasure in tearing,” he commented recently. The Cataract Sections lack the visual evidence of destructive actions that characterize the Cataracts and are much more impassive. From a distance they resemble geological specimens but closer inspection reveals that all kinds of extraneous matter are included in the mix. Are they beautiful or are they repulsive, or are they both at the same time. As described by Wang Min’an, “Shang Yang uses chemical substances directly as ready-made materials…..Why does he use such materials? There is no doubt that these chemicals are the most serious causes of the destruction of the earth. In other words, on one hand Shang Yang displays the reality and the results of the destruction of the Earth, on the other he displays the materials which are destroying the earth.” Cataract – Mysterious Object represents a new departure for Shang Yang, a three-dimensional object fabricated from resin and cellphone placed on the floor that emits a feeble light at irregular intervals. Shang Yang believes that the role of the artist is to reveal profound truths about society, not in a didactic manner but through creating works of art that stimulate viewers of his works to ask questions, not only how they are made but what they mean. Decayed Landscape, Cataracts, and Cataract Sections are exemplary in both respects.